Transport Demand Management (TDM) is the approach in sustainable transport policy. TDM comprise of strategies to alter the travel behaviors and modal choices via demand-based method, permissible to accomplish effective transport planning. The two modules easing the traffic are supply-oriented measures and efficient management. The supply-oriented measures are one of the categories in the provision of the infrastructure. 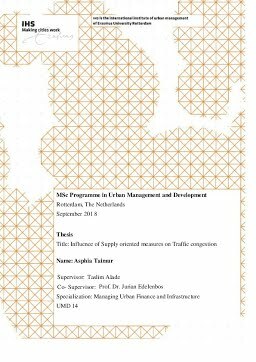 Supply-oriented measures are taken by many municipalities in order to ease the traffic congestion, it is to provide infrastructure to accommodate the demand from the users/ traffic. As a center for the commerce and IT zone, Hyderabad is growing to accommodate more employees from other cities. The huge figure of population in Hyderabad is also influenced by usual population development also because of the employees transferring from adjacent cities due work. As a magnitude, congestion is seen particularly in the IT zone of the city which is Madhapur. A specific zone with 8 junctions are corridors are selected to analyze the traffic condition in the area. The main focuses of the research to find the reason for the inadequate supply-oriented measures by the infrastructure and service provider of Hyderabad (GHMC and HMDA). The data obtained using qualitative approach. Thus, this study conglomerates explanatory methods, with in-depth interviews and observations as research tools by complimenting with secondary data sources. The following research finds that there were inadequacies in the supply-oriented measures taken by the municipalities, as the provided infrastructure did not match with the standards from the Indo-capacity Manual. The inadequacy caused major traffic congestion and was seen in the- PCU values, spatial congestion and time delays. This gives us an overview of the inadequacy of the supply-oriented measures and how the Municipalities can ease it by adopting different methods.